Splash page of alibaba.com, where it would appear that Patrick Campbell became Cassim and was unable to exit with his treasure. Last night, The Smoking Gun and then CBS reported on the latest sting carried out by our government to keep us safe from people too stupid for their own good. This time, instead of the FBI setting up the security theater sting, it was an undercover agent for ICE, or Immigration and Customs Enforcement within the Department of Homeland Security. The criminal complaint (pdf) filed yesterday is written by an ICE Special Agent working out of Miami (I’ll return later to the ironic job position she holds). Once again, as we see repeatedly in the government’s adventures in security theater, we appear to have ensared a small-time hustler but will undoubtedly play this up as a major interdiction of international terrorism. The hustler this time is one Patrick Campbell, who stands accused of brokering a deal to sell U3O8 to Iran. 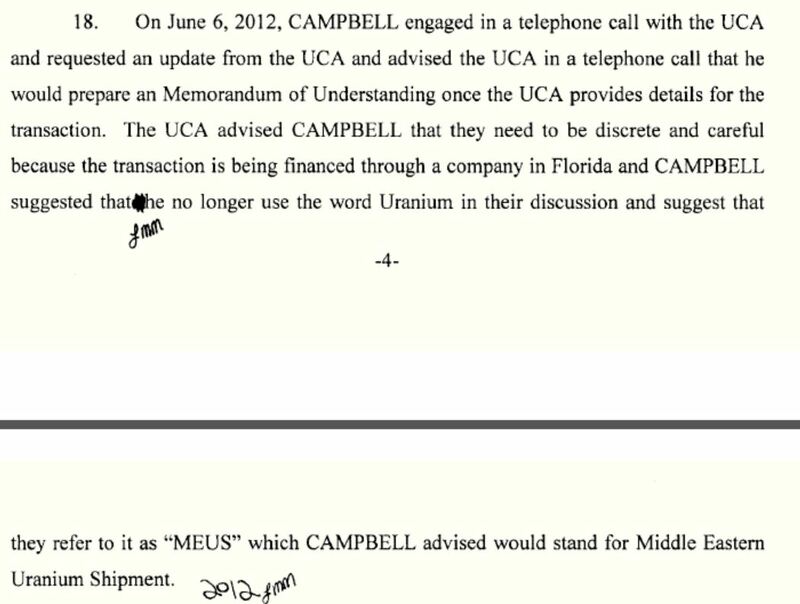 Campbell apparently was promising to ship 1000 tons of the processed uranium ore, but was arrested in New York yesterday Wednesday when he entered the country from Sierra Leone, where he reportedly lives. Yup. Everybody knows that Iran absolutely would go shopping for uranium on alibaba.com. Note that ICE does not appear to be able to get their high-tech document production equipment to produce subscripts. There really is no such thing as Uranium 308 or U308. Writing it that way makes it look like they are referring to a uranium isotope. The naturally occurring isotopes of uranium are listed here, where we see that the atomic masses range from 232 (= U-232) to 238 (=U-238). The isotope of interest is U-235, which occurs in nature as only 0.7% of the uranium atoms. Uranium is mined as raw ore which is chemically treated to produce U3O8, which is otherwise known as yellowcake. For further processing, the yellowcake is then converted to UF6 gas and then put into gas centrifuges where the mixture is selectively enriched for the U-235 isotope. Low-grade enriched uranium has the U-235 enriched from the naturally occurring 0.7% to the range of 3-5%. Iran has also produced mid-grade uranium at 20% U-235 for its research reactor used to produce medical isotopes, but this still falls short of the 90% or so U-235 needed for a nuclear weapon. A foreigner who agreed to sell undercover Homeland Security agents 1000 tons of yellowcake uranium for shipment to Iran was arrested yesterday when he flew into the United States with uranium samples hidden inside the soles of shoes in his luggage, The Smoking Gun has learned. Wow. He tried to hide his yellowcake samples in the soles of his shoes, which he then put into checked baggage. This whole episode is stupid and wasteful on a wide range of levels. First, Iran purchased huge stockpiles of yellowcake back in the days of the Shah. Further, Iran is very close to being self-sufficient in domestic yellowcake production. Even David Albright’s ISIS admits a production capacity of about 70 tons of uranium per year at the known mining sites. The latest IAEA report on Iran (pdf) notes that since Iran’s centrifuges came online in 2007, about 85.6 metric tons (one English ton is 0.9 metric tons) of UF6 have been fed into the centrifuges. At the current rate of consumption, it is clear that outside yellowcake is not needed by Iran. Even more than the fact that Iran may not need outside sources of yellowcake, it seems virtually impossible that they would fall for someone claiming to be supplying yellowcake from Sierra Leone. Uranium is not listed among Sierra Leone’s mining products, which are diamonds, gold, bauxite, rutile and iron ore. 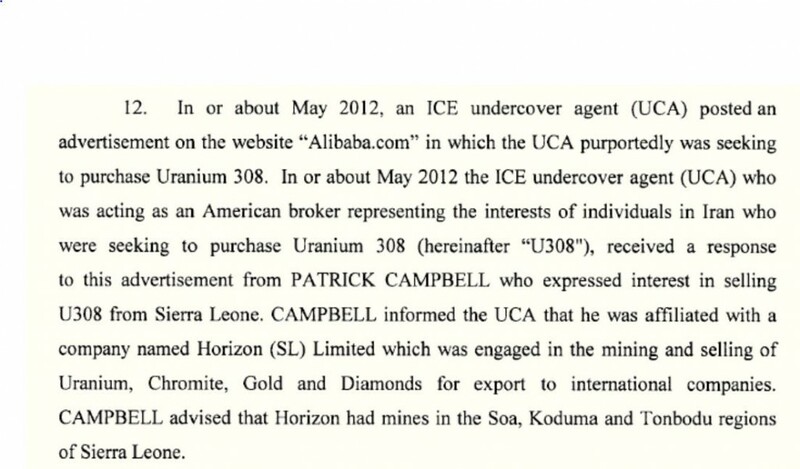 The prospect for mining uranium in Sierra Leone is mentioned in one WikiLeaks cable from 2009 that described “Russia, Iran, Libya and others” as interested in the mining rights, but the prospecting has not yet progressed to mining and Sierra Leone does not appear on the list of African countries from which uranium is produced. So to believe this plot, we are supposed to think that Iran is so desperate for uranium that it would resort to shopping on a website set up for small businesses to sell to one another, and that they would even resort to using a site with a name that reflects an Arabian folk tale involving magic and thieves. And then on the other side of the story we are supposed to believe that Iran would fall for a con artist who doesn’t even bother to provide a plausible explanation for the source of the material he claims to be selling. I don’t know who is more naive, the CIA, the INS and/or the American people. Frankly, this entire episode should be pretty insulting to the average American citizen. It seem much of the American “security dollar” is spent in grade school tomfoolery, there apparently not enough real terror to keep the apparatus gainfully employed. We have descended to the billfold with string on a sidewalk form of entrapment, a form of entertainment for those pulling the string. I guess. I would suspect, from the way the document is written, that it was being dictated to a typist who had no knowledge of chemistry. ‘U 308’ is a giveaway. Also, why the heck would someone be trying to sell yellowcake to Iran? They can mine it. The criminal complaint is even better when read in your best Inspector Jacques Clouseau accent. Good report, Jim. Given the current atmosphere of skepticism, how exactly do we know that what the FBI found in his shoes was indeed yellowcake? How does a salesperson who doesn’t know his isotopes know that he’s not getting turmeric, for example? Methinks the U308 is an intentional intelligence test to screen out folks who know their stuff from the easy marks to sting. Wonder what other intelligence test tactics the DOJ and DHS are using just to generate arrests? And how lucky for the Security State to have previously laid out an entire Yellowcake Narrative for the USAn people, thus enabling all of us to understand what’s at issue here without a pesky sidebar “What’s Yellowcake, Anyway?” Sometimes old lies really do pay off!